We're longtime fans of the Draft Kevin Durant blog, if just because of the obsessive single-mindedness of it. (Even if it hasn't been updated in a while.) When Greg Oden went down with an injury, it was all the site could do not to cackle. 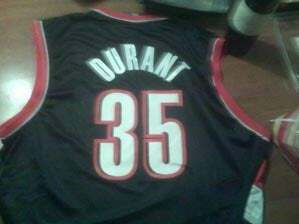 Well, the blog's purveyor went to Blazers.com and bought an official Durant Trail Blazers jersey (and is wearing it to the Blazers game tonight), which is an obsession culmination we can respect. We don't know if anyone owns a Jordan Blazers jersey, but we like the idea. What other woulda shoulda couldas are out there? Seems like a fun Friday question, we suppose.